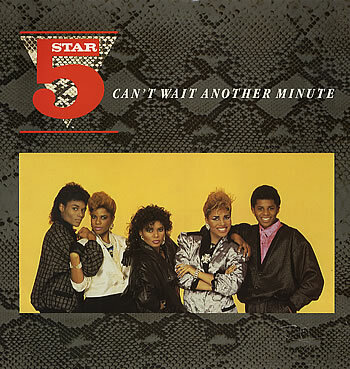 Jheri Curl Fridays 52: "Can't Wait Another Minute"
British family group Five Star scored a top 10 R&B hit with “Can’t Wait Another Minute,” and we’re bringing it back for Jheri Curl Fridays! Americans have always had a weird relationship with British soul musicians. Although there’s been a fairly solid stream of R&B coming from the UK ever since the Sixties, success on these shores has been fleeting for most of those acts. Even now, the list of British acts to top the American R&B chart is fairly small: Loose Ends, Soul II Soul, Lisa Stansfield and George Michael are probably the first names that come to mind-forgive me if I’ve missed anyone. Although they never scored a #1 hit on any American chart, the sibling quintet Five Star was a force to be reckoned with for a hot minute mid-decade. One of the few co-ed outfits to make any noise in the ‘80s, the Pearson siblings were a singing/dancing combo that first gained fame in their home country. Managed by their father Buster Pearson, and were clearly styled after The Jacksons. The voice of lead singer Denise (or Deniece, I’ve seen both spellings) was comparable to the higher register of Janet Jackson (who came into her own as an artist right as Five Star took off) and they rode catchy hooks and tight choreography to the Top 10 of Billboard’s Black chart with three separate songs from their first album, 1985’s Luxury of Life. This is a pretty irresistible groove. It’s also a hilariously dated video. How can you not love the fake city backdrop? Or the heavy-on-the-hand-gestures dance movements? It would stand to reason that Five Star would have been as big as other family pop-dance groups popular during that era (like The Jets, for example) but alas, that wasn’t to be-at least in America. The quintet continued to release albums into the early Nineties, but returns continued to diminish. The group has reformed in various permutations since, and Denise/Deniece recently appeared on the UK version of “The Voice” in addition to performing in the British theater-singing the songs of Michael Jackson. Circle completed. Now, watch the video again!